It is once again the end, though still the beginning. 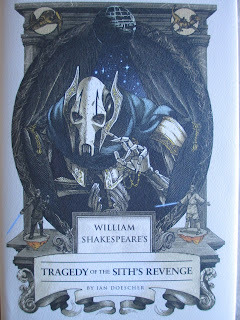 The end is the end of the prequel trilogy's William Shakespeare's Star Wars treatment--and the beginning is there because, well, Ian Doescher basically said in his Afterword that he will be doing the upcoming trilogy, as well (as I was hoping he might). Do I even need to say again what this series has elevated into? It's a high tribute to this story--but it also is this story. It's the same frame and the same basic dialogue, just eased into beautiful, detailed language. And the transition is so smooth that it causes me no pause anymore. I've been kind of sick this week, and at one point I picked this book up to try and read some (I had planned on finishing it much more quickly before my eyes became like to water fountains); for a moment, I forgot I was reading a Shakespeare-ization because of how smoothly the words flowed (and because my slightly muddled head made me forget that these words even existed in any other context). It's like this story was made for this treatment. There are stellar moments in here, like when Padme is pondering while Anakin is going over to the Jedi Temple to carry out the Emperor's orders (I know he isn't Emperor yet at this point, but I always call him the Emperor). Or some dark humor when the Jedi are wondering about Order 66. Or that Hamlet reference when Palpatine uses a play to win over Anakin: that was a brilliant use of material. And, yes, the whole final moments are--wonderfully tragic. My favorite of Nicholas Delort's illustrations this time would be the cover, Yoda with the clones, Padme at the Senate when Palpatine forms the Empire, and the image of Padme's funeral. Oh, that funeral image: it was almost transcendent when I was staring at it. That shot in the movie of her is beautiful, the way that they made her echo Ophelia (for the tragedy of love and all)--and here we have the echo of a Shakespearean plot come around and be in a Shakespearean-style plot. That was a great moment of staring.